Serving you with quality, flexibility, on-time delivery, and competitive pricing. We seek innovation, efficiency, and constant improvement. We provide long run, short run, and prototype machining services. Complete product assembly with optional drop-shipping to your customer. We support lean manufacturing and just-in-time inventory needs. 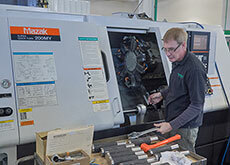 Horizon Systems Machining provides CNC milling & turning services to customers nationwide. We have earned a reputation based on quality, flexibility, on-time delivery, and competitive pricing by fulfilling requirements for precision, accuracy, quality, and value. Our spotless CNC machine shop can handle virtually any material, quantity, finish, tolerance, delivery schedule, and inventory control requirement. 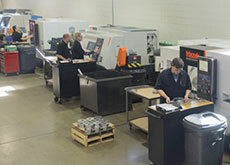 For machining prices, request a quote for your next project today. We machine a wide variety of metals including Hastelloy®, titanium, aluminum, Monel®, brass, carbon, stainless steel, copper, and also plastics. Our parts can be found in a diverse range of industries including medical, ink jet, electronic, automotive, HVAC, material handling, food processing, automation, and valve.